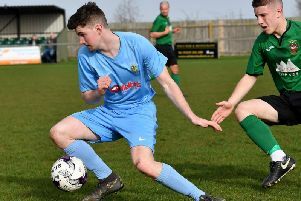 Oakfield & Rowlands entertained Star Alvis in what promised to be an intriguing game on Saturday. It was second v third in the league, with the hosts looking for a victory to build a gap between them and the chasing pack whilst hoping to keep the pressure on table toppers Warwick. Home skipper Mark Randle won the toss and elected to bat, but the home side made a poor start losing both openers cheaply. Jack Randle and Rob Harris rebuilt with a 50 partnership before Harris fell for 25. Craig Gowdy made 15 but it was left to Randle to hold the innings together as wickets fell at the other end. Randle made a fine 86 before being stumped leaving Oakfield & Rowlands 168-8, still some way behind the 200 plus total they wanted. O&R do bat through to number 11 and this proved vital again. Oli Vaughan and Dave Odwell added 20 for the last wicket to get the hosts to 203 all out in 49 overs, Vaughan the last man to fall for 25. This was no more than a par score and the home side knew they would have to bowl well, particularly with only four front-line bowlers. Oli Vaughan made two early breakthroughs, and Dave Odwell (1-32) picked up a wicket too to get O&R off to a good start. Star Alvis are always a tough nut to crack and they fought back through dangerman Mann, who made 49 before skipper Randle dismissed him. Jamie Brightwell picked up the fifth wicket but at 170-5 the visitors were firm favourites. Skipper Randle gambled at this point, deciding to bowl his main four bowlers through and brought back Vaughan to support Brightwell. Vaughan picked up the crucial wicket of Pathak, caught and bowled for 53, to open the game up again. Brightwell (3-32) struck twice more before Vaughan blew away 10 and 11 on his way to 5-62 as The Paddlers completed a 27 run victory. With Warwick suffering a surprise defeat the day couldn’t have gone much better for the hosts. With daylight between them and the chasing pack, and two games in hand over Warwick, an exciting end to the season is in store for the side, who remain unbeaten this season. Oakfield & Rowlands visited a strong Copsewood on Saturday, again missing players due to unavailability in the 1sts. The hosts batted first and amassed 323-5 declared, with Cuxal scoring 117. Herman Claassen and Dan Clowes picked up two wickets each and Rikesh Vaghela one on a tough day for the bowlers. Chasing leather in the heat had taken its toll on the visitors with only Dan Pfadenhauer (44) and Chris Goodwin (20) making a meaningful contribution as they were bowled out for just 106. A tough day at the office in a very competitive league - with better availability throughout the club the side will be hoping to pick up some more wins in the remainder of the season. The 3rd XI were involved in a great game of cricket at Swinford on Saturday. Home skipper Ian Randle won the toss and elected to bat, and once again led from the front with 63. He was well supported by Ben Simms (39) and Chris Smith (30) before young Joe Green added a quickfire unbeaten 25 to take O&R to 229 all out. After tea the visitors made a solid start with openers Popat (76) and Ali (54) laying the foundations for the chase. Joe Green led the fightback with 2-42 before spinner Jack Watts ran through the middle order with 4-58. With two run outs added to the equation, the match went to the final over with the visitors getting over the line with two balls and two wickets left. A great effort by the hosts. The 4th XI took on RMCC 3rd XI who are flying high in the table this season. The experienced hosts won the toss and elected to bat first, scoring an impressive 348-8 from their 45 overs, largely based around opener Baig’s 120. The wickets were shared around the Oakfield & Rowlands bowlers with 3 for Adam Wanless, 2 for Luke Fernando and Kishan Mistry and 1 for Amit Patel, the visitors attack sticking to their task manfully. The hot weather had affected the 4th XI too, as they lost early wickets in response. Skipper Dinesh Fernando fought hard with a knock of 38, and Adam Wanless hit a quickfire unbeaten 33, but he ran out of partners as the visitors were dismissed for 128.